On November 22nd, national elections are held in the Netherlands. I'll have to resort to speed-diarying (in English) to get every electable party a necessary introduction in the hodgepodge that is the Dutch political landscape. Below, an overview of the Dutch political right. Be forewarned that I'm extremely biased. Secondly, before I run into troubles on gradations again, I'll refrain to the orientation of the parties using the gradations centre - centre-right - hard right - extreme right. I will briefly discuss the parties at the right of the spectre starting from the centre. A coalition party of the current government, under the leadership of Jan Peter Balkenende, the Dutch minister president. CDA is an amalgamation of three Christian parties, catholic and protestant, which coalesced together after constantly shrinking in size in the seventies, during the weakening of the pillarisation within the Netherlands. Although still officially touting their Christian roots, the Bible is seen as a possible inspiration for party members and the party also readily embraces members adhering other faiths than Christian ones. Although a self-proclaimed centre party, history shows that CDA is willing to bend either right or left when the occasion present itself, making it practically indispensable from the political hobnobbing during coalition formations. The Balkenende government is considered to be a centre-right government, strongly influenced by the more economically liberal ideas of the VVD party (see below). High ranking party members have openly professed their displeasure with the absence of a socially orientated program and dearth of environmental policy. The VVD formed the second important leg to the Balkenende tri-partite but was perceived to have dominated the policy of the past four years. Interestingly, CDA now gets most of the credit for the economical upturn. Although supportive of the welfare state and progressive in individual rights, VVD also has vociferously pursued market liberalisation and private entrepreneurship. They released a Liberal Manifesto in 2005, written under the guidance of the party-leader of that time, Van Aartsen, and advocating, for example, a direct election of the Minister President, a direct election of mayors, a person's right to choose euthanasia (which is the current situation in the Netherlands). 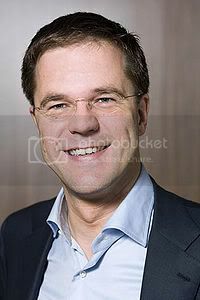 Their latest period of governance has brought forth the two ugliest sides of the party: neoliberal marketista policy in the shape of the current party-leader Mark Rutte (see picture) and populist immigrant bashing in the shape of Rita Verdonk, the ex-prison director and now controversial minister of Integration, hugely responsible for the downfall of the second Balkenende government, the past summer. Enough reasons for me to stamp the VVD as the Scary People Party. Mark Rutte won the party's leadership by a hair from Rita Verdonk, mostly because of the debacle Verdonk created over Ayaan Hirsi Ali. Still, Verdonk is prominently number two and over the course of past weeks it's becoming clear that Rutte is perceived as weak and the party is completely divided and held hostage by the Verdonk faction. Polls still have the VVD at a loss, and the party is increasingly pinched between the popular CDA and the populist nonsense paddled by the hard right factions. A strange duck in this pond. Morally, they're far more conservative than VVD and CDA and follow the Bible as their soundboard. Although they try to avoid the subjects, it's clear that ChristenUnie would prefer to see abortion, euthanasia and coffee-shops scrapped as quickly as possible. Socially, however, they've developed a remarkable program, including thoughts on a sustainable energy policy, a reasonable humane integration policy, and a call to stop all subsidising on sugar, rice, diary products. They're up in the polls, probably attracting voters disappointed by the CDA's lack of social policy. In fact, their social program is so different than that of the VVD, Mark Rutte has already announced he'd not be able to cooperate with ChristenUnie as a coalition partner. (Although this is generally macho-talk happening every time before an election, it underlines how far the VVD and ChristenUnie stand from each other.) You could just as easily class the ChristianUnion as a conservative party at the left. The Dutch Christian Fundies. They are the oldest political party, have never been in the government and for as long as I remember are stuck with two to three seats in parliament. Perhaps they could have twice as many seats, if the party wasn't constantly proclaiming that women have no role in politics and shouldn't be entitled to vote. Most of their adherents come forth from the Dutch Bible Belt. At the county-level, SGP often joins forces with the ChristenUnie, but in this election the ChristenUnie has refused to go together. This may have something to do with the fact that many find the SGP simply too extreme. Hopefully by 2050 the party will finally collapse under the influence of inbreeding and sheer stupidity. Good grief. We've at least three of those idiot splinter parties, all new. I'll do this succinctly. The remnants of the Pim Fortuyn party, which surged to 26 seats in 2002 after the murder of Fortuyn, became part of the first Balkenende government which collapsed after 87 days of turmoil and hugely embarrassing internal strife. The Hague had never before resembled so much like an Italian mob struggling for power. The party has never given up smearing their own people and backstabbing. They've re-branded the party, put up a new MBA figurehead (completely ignored by the media) and polls show that they will most likely lose all 8 of their remaining seats. Good riddance. However, from out of the ashes, comes Marco Pastors from Rotterdam, where Fortuyn made furore with his local party at first. He has joined forces with another Fortuynist, Eerdmans and they both carry out former Fortuynist viewpoints. It should be said, though, that I find Eerdmans actually quite a respectable politician. He has practically vilified the CDA for not changing anything in the bio-industry. His choices on immigration and integration, however, bring him to the right of the spectre. 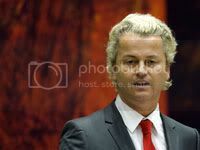 And last but not least, there is Geert Wilders. Who doesn't know him? An ex-VVD man who split of from the party when the VVD decided to start EU membership negotiations with Turkey. He's now channelling every possible medium to warn that the Netherlands stand at the eve of a "tsunami of islamisation" (he actually said that). Extremely libertarian, it's no wonder he flirts with the Republicans within the States. Opposes further EU enlargements (including Bulgaria and Rumania!!!!) and wants to scrap the European Parliament. Incredibly, he polls consistently at four, five seats. Loony Tunes at work. If there's any relief in this quartet of idiots, it's that the gang of extreme right nationalist have not been able to peep in. I'd almost say, there's no need for them anymore. Will the Dutch political left be any better? Find out tomorrow, after I have taken another bath. Incredibly, he polls consistently at four, five seats. Loony Tunes at work. +grisly murder of Theo van Gogh? But that's putting it too black and white. Anti-islam sentiments were rive long before, which also was the source of the popularity of Fortuyn. Everything concerning Muslim fright just stacks up on top of each other. But the rise of radical terrorism cells in the spirit of a contorted Islam certainly have not helped to ease feelings. Nomad, can you explain pillarisation, and whether that is the root cause of the Netherlands having such a large number of political parties? a phenomenon which has produced a whole shelf of erudite books? The Wikipedia entry gives the description that's workable enough for now. Society was "vertically" divided in several smaller segments or "pillars" according to different religions or ideologies, which operated separately from each other. These pillars all had their own social institutions: their own newspapers, broadcasting organisations, political parties, trade unions, schools, hospitals, building societies, universities, scouting organisations and sports clubs. Some companies even only hired personnel of a specific religion or ideology. This led to a situation where many people had no personal contact with people from another pillar. The classic division between Catholics and Protestant was in the historic divide between the faiths, which had its roots during the reformation in the Eighty Years War. (I did a brief description on that process in a reply to afew somewhere; I'll look for it.) The Rise of the Socialist and its friction with the entrepreneurs is a classic blue collar vs white collar class struggle. Whether it's the root cause is debatable, but the pillarisation of a multicultural society was certainly a driver for starting off fragmented. Pillarisation has its roots in the 17th century, but it did not come into existence until the late 19th century, and lasted until the late 1960s. Coincidentally, it was started by the first national political party that the Netherlands had. Before the 1870s, the Dutch parliament only consisted of individual members, even though all political power had effectively been switched from the king to the parliament in the 1848 revolution, and Thorbecke's Constitution. The majority of the parliament was (classical) liberal, due to the franchise being restricted, and the liberals held on to the principle that each parliamentarian should be independent (this is in fact enshrined in the Constitution). The struggle between the royalists and the liberals that ended in 1848 took on a somewhat different form after the decisive liberal victory, transforming into a struggle between the protestant politicians who wanted a theocracy and liberals. A key demand of the protestants was equal funding for religious schools, around which the first political party was organised. This was the Anti-Revolutionary Party, which was formed in 1879. Incidentally, its name is intended as a rejection of the values of the French revolution. The idea of the ARP, as the wikipedia article suggests, changed from establishing a theocracy to ensuring 'sovereignty in [its] own sphere'. This was gradually adopted by the other groups, Catholics and Socialists, although the liberals were never too happy with it. This is the political part. Another part is social/economic. Pillarisation would have been more difficult to establish in a pre-industrial, rural society, and the industrialisation, and mass move of people from the countryside only really took off in the 1880s (in The Netherlands). Most of the aspects of pillarisation require a modern, somewhat literate society. Did this lead to our fragmented political landscape? I don't know. In part, maybe, but there were only three real pillars plus the liberals. I think that the fragmentation is more due to the splintering of the protestant churches. Each church sort of got its own party. Another part is due to the fact that we have a proportional representation system (for the main chamber of parliament) without an election threshold beyond the requirement of getting 1 out of 150 seats, which will naturally lead to some degree of fragmentation. It's an interesting question how this institutional setting interacts with the social reality. In a district-based first past the post system, there would probably have been less splits between the protestants (also on the church level), and they would probably have merged with the catholics a lot earlier. I learned something today. Thank you!! Had to do the 1870 to 1914 period for my Atheneum 6 History class. Amazingly, some of it has stuck (7 years after). You mean something along these lines? I'll e-mail you the R code tonight. I've put the R code in the wiki. I'll don my lab coat and start experimenting... Thanks a bundle. Sorry I didn't respond, I had friends coming over for dinner. Real Life and all that. What spectre? Harry Potter's undead twin? Thanks for the diary! Very interesting. Sadly as a buitenlander I can only vote on the possible enlargement of the local camping ground, but I'll still be biting my nails Wednesday evening when the results start to arrive.. Any advise on which channel to watch? Completely irrelevant comment: reading this sentence, with so many Dutch names in it, I heard it in the voice of the late Rudi Carrell. Nice diary! I'm looking forward to the next one. On the right-wing parties, also see this podcast on the EurQuest EuroBlog. The bible belt originated when protestants fled north from the Spanish Catholic armies after the declaration of independence. It stretches from the west-coast in Zeeland to Overijssel in the East. The more orthodox members refuse television (and internet) but it's not like the Amish. It's just very traditional with a man at work, a woman at home and as much children as possible. And how many people? 50,000? Well the SGP consistently scores two seats in parliament, that's 80 000 votes. Women shouldn't vote according to party orthodoxy but I don't know if that means their votes are lost or that the man votes for them. Great job Nomad.. great job!!! Keep curing my ignorance! Thanks. funny image of ignorance hanging in a cellar like a prosciutto! Never been in a real prosciutto cellar, but no jamón serrano hangs around long, if I am present. Wilders is actually the left's useful idiot. VVD and CDA will never dare take him aboard in a coalition and he takes up 5 seats which might otherwise have gone to one of their parties. All of these parties combined currently poll for 76 seats in a 150-seat parliament (peil.nl). But SGP and all the hard-right parties are not coalition material. I expect (or hope) a lastminute meltdown of SP in favour of the PvdA, and a prime-minister Bos. But more on that when nomad has written his piece on the Dutch political Left. I'd prefer a last-minute meltdown of CDA and a Bos government involving SP. BTW, I forgot: what are the lower limits of entry to the Dutch parliament? 16 million people, say 10 million can vote; 70% of that will vote; divide by 150 for one seat = somewhat over 40.000 votes to get in parliament. Oh, me too, me too.. and GroenLinks could join SP and PvdA as well. But I think that CDA is in the lead in all the polls at the moment. But right now, I don't think it's happening... If the trends of the past week are real, it will be a gruelling aftermath. There really is a possibility of political lockdown, like what happened with Germany and Czech. Bos and Balkenende have clashed heads too often to go all smiles again and negotiate without becoming the joke of the century. The worst option would the Denmark scenario: a minority government between CDA and VVD - in other words, a continuation of what we've had the past aching four years. One remark about the CDA bending left or right: they gladly bend to the right, but will really only bend leftward if there's no other option available. This all started during the infamous 1977 coalition negotiations. The PvdA scored a big victory (best result for them ever), but after failed negotiations with the CDA, the CDA decided to go with the VVD. This basically marked the start of the demise of the left wing of the CDA, which has now completely disappeared.